Do you know that the deadly form of skin cancer called melanoma is the second most common cancer in the UK among young people? Because of this the average age of loss of life from skin cancer deaths is 20. Melanoma is a type of cancer which is not well understood. It is important that we learn more about it because it is the only malignant tumour which has a good chance of being detected early on. This is because most of the time it develops on the skin and can therefore be spotted. Melanoma can start from any part of your skin as well as from moles “ in rare cases it also starts in the eyes and bowel. In most cases it is dark and irregularly pigmented, but sometimes it can be the same colour as the skin and can be small and regular “ this is in the really early stages as you can see in the image below. What is certain is that melanoma continuously changes and grows. The important thing is detecting these changes in enough time through a mole check up or skin cancer screening appointment. Melanoma mostly develops from the pigment cells of the skin. These cells can be found in your skin and in moles as well. It is not yet known precisely what causes melanoma “ there are possible links with UV radiation and genetic mutations “ but when a cell is damaged, it begins to multiply in an uncontrolled manner and the melanoma starts to grow. If this happens in the upper layer of the skin (epidermis), where there are no blood and lymph vessels, it cannot spread through the body as the tumour cells are physically unable to spread. This means that if we spot a melanoma before it can cross over from the epidermis to deeper layers of the skin, our patient can be completely cured with a simple surgical excision. We are delighted when we find that a melanoma is only in the epidermis, because we can greatly reassure that patient. When melanoma spreads deeper into the skin, where there are blood and lymph vessels, the chance of it spreading further in the body (metastasis) increases. Metastasis is the movement of cancer cells that travel through the blood and lymph vessels from the original tumour site to other organs, such as the liver, lung, brain and bones, where these cells start to multiply and grow. In turn this will compromise the function of the affected organ or organs. The answer to the common question: “What is melanoma like?” is the same as to “What is a flower like?” It is varied and can appear in a range of colours and shapes. It can look the same as a mole. Another problem related to melanoma is that an untrained person, even a qualified doctor or nurse who does not work with melanomas on a daily basis, might not notice the changes until it is too late. This is why screening is important, so that we can check your moles even when you don’t have any particular concerns. In the image below you can see the changes in a totally benign looking mole on a 23- year-old patient. Using our full comparative assessment methodology we were able to detect this minute change and go on to diagnose an early melanoma. Once again this helped us save another life. 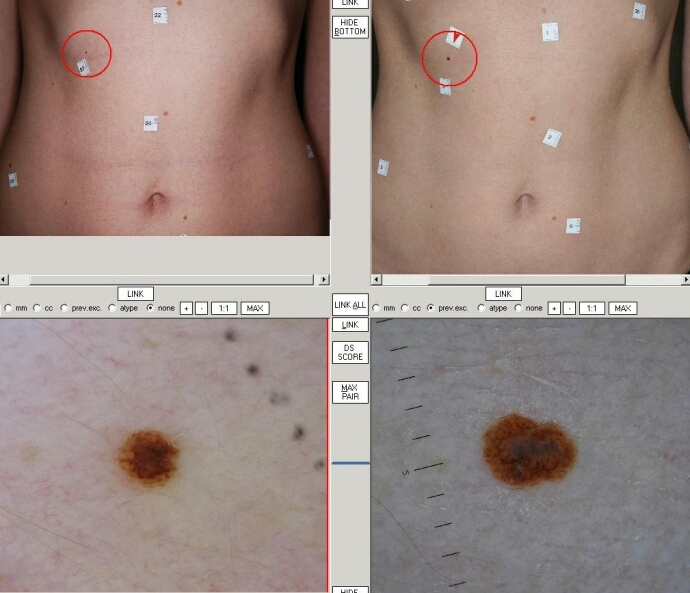 The method of screening used is important in determining how early melanoma can be detected. A visual examination done without a medical instrument “ however experienced the doctor is “ can only detect melanomas that are visible to the eye. In our opinion the best screening method for detecting melanoma at the earliest stage is the one that we use at Melanomamobil, namely a total body, full comparative screening method. 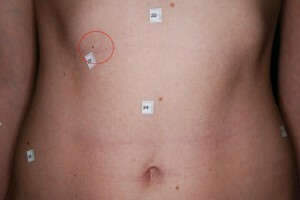 This method allows us to detect melanoma “ based on its changes “ even when it is not visible to the eye (see the image above). Due to this the melanomas we are able to detect during screenings are early stage melanomas and can be cured. Fortunately we do not detect melanoma or malignant tumours on everybody we screen although we recommend that everyone should have a screening. This is because before you come for a check up you cannot be certain whether you have an early melanoma or not. Our detailed report and the risk analysis will inform you about your own personal risks. There are many misunderstandings and misconceptions relating to melanoma. For example, one very dangerous misconception is when people think that it is better to leave moles alone and not to disturb them. If you have read this far, you will understand that every single day counts when it comes to removing a melanoma. Waiting and refusing to deal with suspicious moles could be extremely dangerous, possibly fatal. Is everybody equally at risk? There are certain factors that might increase your chances of developing melanoma. In addition people who have once been diagnosed with melanoma run a greater risk of developing a subsequent melanoma in the future. Unfortunately no one is safe from melanoma but it is true that the majority of our patients are people with the risk factors mentioned above. The question is what can we do to lower your risk of developing melanoma? Strictly protect your skin from the sun to avoid getting sunburnt. This is particularly important for children and is a key parental responsibility. Having a mole check-up might turn out to be the best decision you’ve ever made in your life.